This was a series of work investigating ways of constucting interlaced wall pieces, with reference to maps. Using the grid structure inherent in an original map, the grid was systamically re mapped using pins and thread onto the wall, eliminating all other cartographic information. 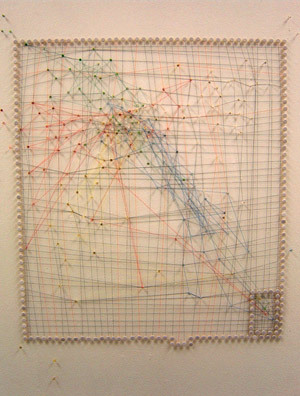 Colour coded mapping pins, decorated with hole punched segements from a coloured paper map are remapped across a constucted graph from a map, then threaded together to create an interlaced stitched effect. Materiality and making blend together in this example of the remade map, drawing reference from and simulating sequined cloth. 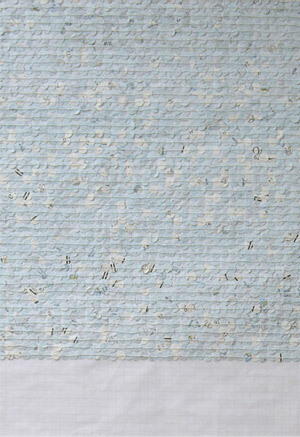 Hole punched parts become sequined studs; lightweight paper becomes heavy through application. The sequins fit neatly into the space of a single square on graph paper. Two sheets of paper represent, separately land mass and sea mass. 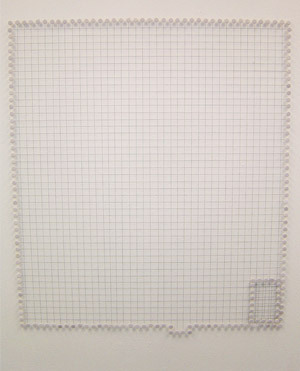 Blank space represents…….blank white graph paper. Reference to the act of repetition, routine, labour. 3 lines in an hour accentuates this passage of time- the irony of days spend, time invested in work.